Prominent Sudanese author, Abdelaziz Baraka Sakin, on Thursday accused state security agents of seizing his books from an international book fair in Khartoum. The action is the latest by authorities in what freedom of expression advocates have described as an intensified media crackdown since last year. Abdelaziz Baraka Sakin told AFP that his short stories and novels -- which are not published in Sudan -- were initially held up at the airport while the works of other authors were allowed in for exhibition at the fair. After he threatened a hunger strike, his works were displayed at the fair for three hours early this week but authorities moved in when they saw "a lot of people coming to buy my books," he said. The security service told him that the books were seized for "evaluation". "Banning me is a political issue," he said. "All my books are about marginalised people and about war in Sudan." Sakin, 49, said that among the works seized are: "Messiah of Darfur", which focuses on the long-running conflict in Sudan's far-west Darfur region, "Khandries", about the poisoning of street children, and "Jungo Stakes of the Earth", which addresses the situation of seasonal labourers in eastern Sudan which was awarded the prestigious Al-Tayeb Saleh Award in 2011. Some of Sakin's works have been translated into French, English and German. 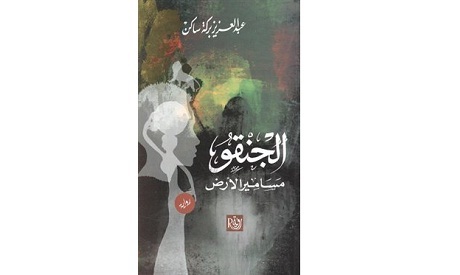 The author, who writes in Arabic, says all his books have been published in Egypt or Syria. Officials could not be immediately reached to comment. where to get the arabic version of Sakin books??? We are living in Oman , I want to buy Sakin,s books (Arabic)but could not get them anywhere.